MeitY in collaboration with leading Semiconductor Companies is offering internship opportunities for the students of participating institutions under the SMDP-C2SD Programme to generate industry-ready manpower promoting industry-academia interaction. The interns will be able to learn the complete design cycle (starting from design specifications to fabrication of chips) for development of SoCs/ Systems, ASICs and FPGAs based designs. Eligibility: Students pursuing M.Tech/ Ph.D in the area of VLSI having sufficient time left for the completion of their internship. Detailed CV (only in pdf format). Name of the Guide in the current research work that is being pursued. Details on Internship start date, Internship duration, Stipend during the internship, etc. 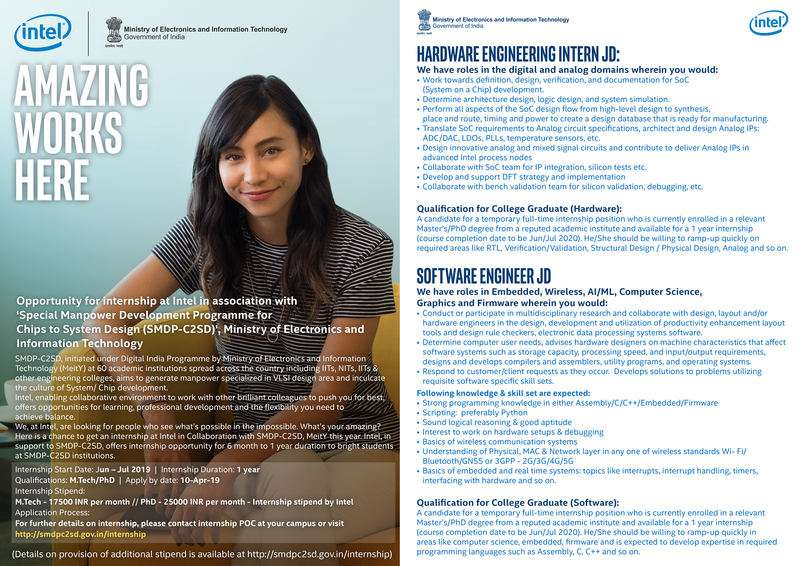 will be made available in the internship flyers and additional details can be had from the internship POC of the institutions. (Provision of additional stipend is at the discretion of the Institution). For details on Internships offered by Intel - click here.